If you receive this as an e-mail, please click on the title of the post and read it on the website. June is busting out all over! And boy, do we who live up here on the prairie appreciate it. After a long winter, everything is now green, green, green. This May, the apple and chokecherry trees had bumper crops of blossoms. The lilacs opened en masse. 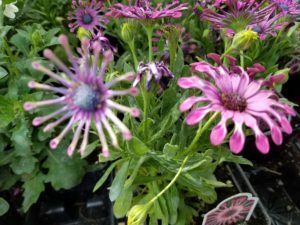 As soon as greenhouses were stocked, dozens of carts rolled through the aisles piled high with pots of alyssum, daisies, geraniums, petunias and every imaginable veggie plant. We were pleased to be out there pushing carts, too. Last year at this time, we had just moved, and there were Bobcats roaring around the house moving dirt and rocks. This year, we’re pleased to have actual grass and weeds. Swept up in the joy of spring, I joined the Bismarck-Mandan Garden Club, and in a weak moment, the Daylily Club. These organizations are filled with Master Gardeners. 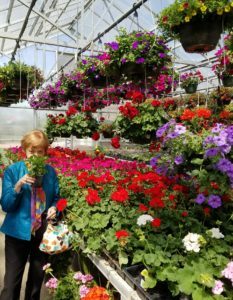 You can pick out their homes by the wonderful landscaping and quality blooms in their yards. Since I’ve only successfully grown one Daylily, I question whether I deserve to be a member in good standing. Also, last year four out of my six new rose bushes died. Still, wearing a new pair of garden gloves and fancy sandals, I’m determined to make our postcard-sized yard beautiful. 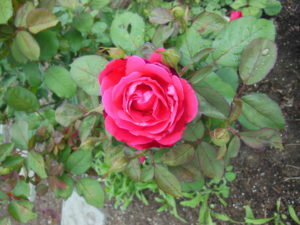 Of the two remaining rose bushes, one was up right away this spring, while the other slept in. I’m happy to say they’re doing fine and one is blooming! In fact, in the past two weeks, most of our garden has been growing. I say most of it, because of the green beans. They came up right away, then disappeared. It seems some of our wilder neighbors (rabbits) like them for breakfast. Then there are the chukars. These brown Hungarian partridges thrive in Bismarck. While they’re shy, they aren’t afraid to stroll across our patio and wallow in the garden dirt. Nothing is growing in their favorite spot. Now, we’re working on the front yard. We dug in an old-fashioned rose bush, a short row of Hostas, and Daylilies! (Purchased from A Garden Club member.) Each plant has a name attached. I only hope to be organized enough to remember which plant is which. I’m having trouble with other parts of this landscaping business, too. For some reason, we sold our nice outdoor table and chairs, but our aging picnic table survived the move. I wrote a sad tale about it last year. It was a center of outdoor activities for our family for decades. The night it was hauled away was a low point in the moving process. Well, surprise! It went to our son’s garage, survived the moving sale, and showed up at our twin home. Now, the darn thing needs another coat of paint. Also, the view outside my office/guest bedroom window is of the utility wall of the tall, beige house next door. There is nothing inspirational about it. Wouldn’t a trellis with climbing roses or grape vines look nice there? I didn’t mention this to anyone, so it seemed like an answered prayer when friends offered us a wrought iron archway. We went to look at it. With a little sanding and a fresh coat of paint, it would be lovely. We didn’t realize how big it was until our friend delivered it. It’s eight feet high, with a five-foot wide gate. We soon realized that the small space outside my window is too narrow and sloped to hold the behemoth, even though it would be cemented in the ground. It would look a little strange in the back yard because we have a rock wall right behind the house. In other words, the dream archway is turning into a nightmare. As I’m swept up in the joys and trials of spring, I’m also trying to pause to smell the flowers. Noticing the beauty around us and counting our blessings every day can add happiness to our lives and the lives of others. I Thessalonians 5: 18 says, “Give thanks in all circumstances; for this is God’s will for you in Christ Jesus.” It is one of many Bible verses that has been proven true by science. It really is healthy to have a thankful heart. That said, I’m thankful for you, my readers, as the Prairie Lighthouse Blog begins its fourth year. Blessings to all of you. I’ll be at the Downtown Arts Market in Jamestown on June 14 from 5-9 p.m. Please stop by if you are able to attend. Both of my books, By the Banks of Cottonwood Creek and Secrets of the Dark Closet will be available.